Note: We’ve decided to stop sending this newsletter. We love the NYC tech community more than ever, but have come up with some better and hopefully more impactful ways to contribute to the great stuff that’s happening here. If you want to learn about new NYC initiatives we’re launching, sign up for our newsletter here. As a seed-focused venture firm with offices in New York and Boston, we believe there’s a responsibility for us to not just be participants in the local entrepreneurial community, but also contributors to it. That’s why we’ve created a number of resources for founders and techies in the New York ecosystem, including our continually updated Hitchhiker’s Guide to New York Tech and last year’s NYC State of Seed Report. Independently, one of the things I’ve noticed about social media tech conversations is that they tend to be overly centered on founders and operators from Silicon Valley. While innovation and great ideas aren’t confined to the Bay Area, voices in that geography get more of the limelight. I think that should change — it’s about time that blog posts and articles written by NYC entrepreneurs receive the attention they deserve. 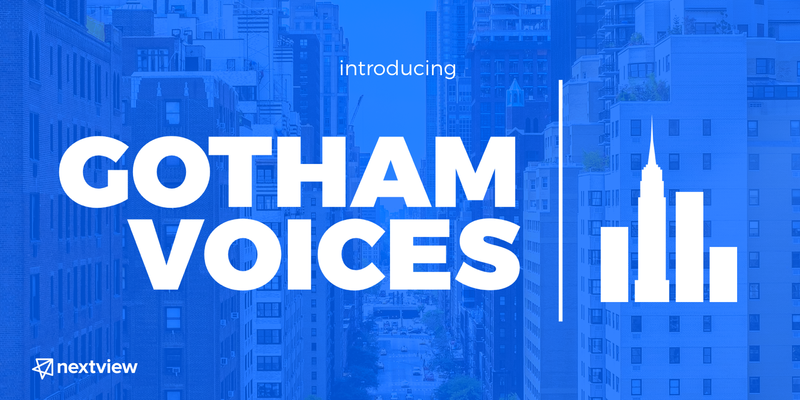 And so today, I’m excited to announce that we at NextView are launching a new email newsletter, called Gotham Voices. Once a week, we’ll be curating and sharing thoughtful blog posts, podcasts, videos, and tips from people in the NYC tech community. Does the world really need another email roundup? We absolutely think that it does. Gotham Voices’ goal is to highlight the people creating the material just as much as the material itself. By focusing specifically — and only — on people from the New York tech scene, we hope to intentionally amplify the voices here and help further build the local community.